The Long March 2C rocket launched with the Shijian 11-06 satellite at 10:46 a.m. Beijing time on March 31, 2014. China launched an experimental satellite Monday aboard a Long March 2C rocket from the Jiuquan space base in northwest China, according to official media reports. Liftoff occurred at 0246 GMT Monday (10:46 p.m. EDT Sunday), according to a report broadcast on Chinese state television. Launch was at 10:46 a.m. Beijing time. 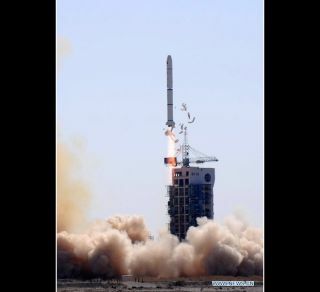 The state-run Xinhua news agency reported the two-stage Long March 2C rocket's payload was the Shijian 11-06 satellite, the sixth in a series of secretive spacecraft launched since 2009. China has not disclosed the purpose of the Shijian 11 satellite series other than classifying them as experimental missions. Xinhua reported the Shijian 11-06 satellite will "conduct scientific experiments in space." Some analysts believe the Shijian 11 satellites might be part of an early warning constellation to demonstrate missile detection for the Chinese military. Tracking data from the U.S. military indicated Shijian 11-06 was in an orbit about 430 miles high with an inclination of approximately 98 degrees. According to Xinhua, the spacecraft was developed by China Spacesat Co. Ltd. under the supervision of the state-owned China Aerospace Science and Technology Corp.
Monday's launch was the first Chinese space launch of 2014. Follow Stephen Clark on Twitter @StephenClark1. You can follow Spaceflight Now on Twitter @SpaceflightNow and on Facebook. Copyright 2013 SpaceflightNow.com, all rights reserved.